In a couple of recent posts about Tim Pawl’s In Defense of Conciliar Christology, I began with some reflections on why it might be meaningful to speak of a single Christology of the early church. I thought I should also declare some of my own interest in that sort of project. As a systematic theologian, I hope to turn more of my attention to Christology in coming years. In doing so, I intend to write Christology that is both classical and constructive; indeed, my hunch is that I will say things constructively precisely to the extent that I say things classically. That means I will be working with the judgments of the ecumenical councils, and treating them furthermore as coherent. So it would be very helpful if, when I begin to publish again on Christology, there were already rumors abroad that there really is such a thing as conciliar christology out there. And even if philosophers (and analytic theologians) kind of talk funny, it’s good to have a faithful philosopher like Pawl seeding the clouds with the idea that speaking of Conciliar christology is intellectually credible and, yes defensible. I bring up Augustine’s lament not because Timothy Pawl’s Defense is an especially bad case of philosophers speaking “in whatever way they like” or not bothering “to avoid offending the ears of religious men in the most difficult matters.” On the contrary, Pawl’s book is among the best and most sensitive of analytic theological projects; an especially good case of an analytic theologian speaking “according to a fixed rule” and serving traditional claims carefully. But even in this best case, the oddness of the conceptual idiom is apparent, and theologians need to extend sympathy and charity to hear this defense as a defense of their own subject matter. I hope theologians will do so, because Pawl’s defense accomplishes much. For the notion of a conciliar Christology to be more readily available and roundly useful for systematic theology, there will still need to be a strong defense of its historical coherence. The conjunction of truth claims that Pawl works with are not self-evident to historians of doctrine, and anybody who ventures the task of asserting the coherence and unity of several centuries of patristic developments will have to win a number of battles with specialists and historians in various periods. Historians of doctrine tend to excel at multiplying differences to divide unities, while systematic theologians tend to prefer long and less convoluted metanarrative arcs and look at the various periods as so many phases in the development of one thing. 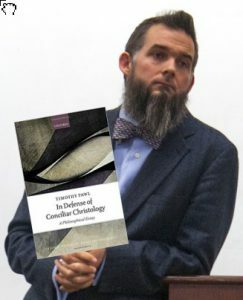 Any theologian bold enough to argue a bravura historical claim that bridges the centuries (consider the recent performance of Aaron Riches, in his book Ecce Homo: On the Divine Unity of Christ (Eerdmans, 2016), who runs from the second century through Cyril and Maximus on the way to a Thomist synthesis) is bound to be bruised by reviews and savaged by specialists. 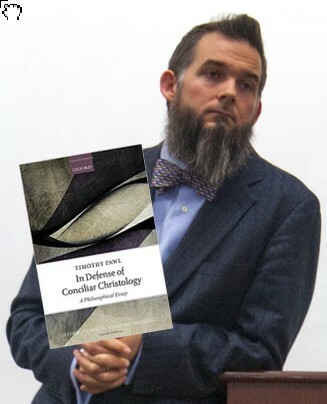 But whenever and however such an argument is made, and however it is applied to the contemporary task of Christian dogmatics and constructive systematic theology, it will be far easier because of the clarifying defensive work accomplished by Tim Pawl in the field of analytic theology.